ii. the analysis and description of roles and attitudes of stakeholders in wolf and bear conservation, in relation to knowledge, perceptions and local needs. On the other hand, the Report starts the progress of the C2 Action of the Project LIFE+EX-TRA, entitled "Consultation and involvement of stakeholders", to be followed by E3 Action, called "Follow-up audit”. This connection function identifies the Report as a typical expression of action - research, in which the scientific evidence, explicit in its purpose and methodologically rigorous, is put at the service of a concrete action, as provided by Project LIFE + EX-TRA. The methodological framework of the Report incorporates the lines of Introductory Report submitted during Rocca Calascio meeting (Turco, 2009). In that document it was stated participatory option as a hallmark of Project LIFE + EX-TRA. At the same time, some elements were highlighted designed to give to the participatory process, assumed as the basis of "best practices" advocated by the Project LIFE + EXTRA, a real substance and a real prospect of achievement. Thus, an approach of scientific research emerged in the anthropological contexts in which it went to be placed the entire action of the Project, especially in terms of determining the consensus and/or dissent horizons emerged within the individual parks over time. This option is based on the idea that the success of a participatory process is not conceivable without territoriality, that is to say the symbolic, material and organizational values that settled societies have given to natural areas. The territory is the geographical expression of human environment with which the hopefully participatory action impacts. Within a local consensual context, and therefore generally favorable to the Park, to its existence and to its behavioral profiles in different fields of action of the Body, one might expect a favorable attitude towards big carnivores. Taking charge of territoriality means that stakeholders are understood not only as local networks of interests that turn around Park, but also as "residents”. This makes them users of the Park, as entity that protects biodiversity, and then, somehow, as a guarantor of a sustainable local development. The park appears, for these reasons, a conservative valorization device, promoting and safeguarding a quality of life adapted to the times and yet inspired by the principles of sustainability. Having gained a degree of institutional trust (confidence) towards Park, these stakeholders, in their extended sense, they are willing to continue to have open and receptive attitudes towards Park initiatives. through the interpretation of its stadial profile. In order to effectively define priorities for action and to optimize modes of action in the participatory processes, that will ensure a confidence recovery and a consensus restoration in local contexts. The Report is the result of a complex work, aimed at balancing the innovating needs of research design with the Project cycle time and the operational needs of land. The research team , led by Angelo Turco, consists of eight members, namely: Lina Calandra (Coordination of interviews, architecture, GIS, data processing), Serena Castellani, Eleonora Di Felice, Andrea Di Vico, Luisana Ferretti, Anna Ludovici (Interviews of land and filling of Evaluation Form), Martina Ciafardoni (data entry and GIS management), Berardina Clemente (Editing). 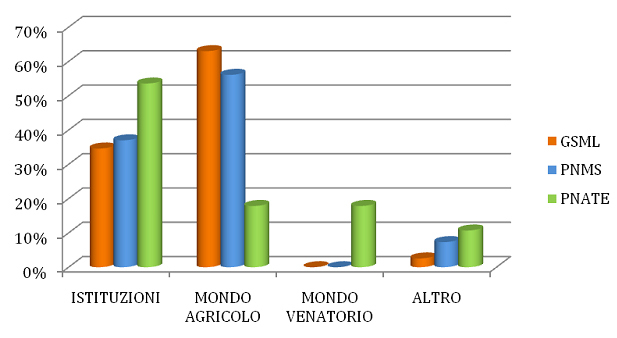 The research team of the University of L’Aquila, worked for seven months in the three Apennine Parks (March-September, 2010) and in the Laboratory. It interviewed with direct approach 523 stakeholders in PNGSML (250), PNMS (173) e PNATE (100), involving all considered types of actors (Fig. 1). It returned the first partial results in the EU Assessment Mission (Assergi, May 20, 2010). It returned more partial results and it presented final results to the three Parks (Assergi, July 20 and September 21, 2010; Visso, November 15, 2010). It then prepared the Report "Big Carnivores between consensus and. conflict in the Apennine Parks. Human Dimensions-Stakeholders Analysis ”. The graphical and cartographic mapping have been developed by CARTOLAB, the Laboratory of Cartography of the Department of Comparative Cultures at the University of L'Aquila. ii. the stadial model, which tracks the consensus of stakeholders, and stratified their position regarding the conflict, divided into three stages: tension, conflicts, reticular contentions. ii. the Evaluation Form (SV) reorganizes the contents of the hermeneutic interview in order to find a consensus and / or to formulate a conflict diagnosis according to the stadial model. Figure 1 - Actors interviewed in the three Parks, marked by circles and actorial types. The Report is thus divided into three Parts. i. Part One describes the architecture of the survey, with brief references to the theoretical - methodological foundations and to the lines of development. ii. The Second Part presents the main findings of the stakeholder analysis, in their general aspects. Following a comparative purpose, is primarily shown what is the situation of big carnivores, and therefore essentially of wolf, in the three Parks (Fig. 2). Then, the horizons of expectation are shown, as matrices of rather ambiguous stakeholders’ attitudes in the three Parks. Starting from the idea that actors have of the role of the Park in promoting local development (in particular through territory and tourism development ), stakeholders develop consensus or suspicious attitudes, which will surely then affect the disputes staging (Fig. 3). Finally, the actual conflictual dynamics are faced (Fig. 4). iii. In Part Three, the results of stakeholder analysis are presented in their specific aspects. Analytically, therefore, but according to a unitary pattern, for each single Park themes are presented, comparatively and briefly faced in Part Two. Each park also includes a notation on future risks considered from the ongoing processes and from conflictual skirmish that are gathered in different ways and at different levels. A quick conclusion summarizes and repeats the role of interface of the Report that closes a phase, as mentioned, but it opens another one. The latter one is directed to consolidate, but sometimes to create (or recreate) the conditions for the participation of settled communities and of the largest users of the Park which, as high guardian of biodiversity, put itself to a wide audience of beneficiaries, as an institution, as a resource and as project serving the sustainable development. • The report catches in the three Parks, in ways and intensity territorially diversified ambivalent attitude of stakeholders toward big carnivores, particularly the wolf: openness and willingness, on the one hand, reserves and hostility on the other one. b) a disappointment, again very popular, for the weak impact of the Park on local development, and this disappointment seems to be linked not so much to objective elements but rather to unpaid expectations or " promises not kept”. - certain types of contention are caught in the nascent status: tensions that evolve in conflicts, conflicts that become reticular and uneasiness that evolve in tensions. • Presenting the Report in its broad outlines, the Authors explain the purposes and the research methodology, which involved with direct interviews a large number of actors: the government, institutions, companies, associations, individual operators, people who interact daily with the Park performing their activities. Developing innovative conceptual and methodological lines, the authors underline, the study provides a scientific analysis of consensus, tensions and conflicts positions that stakeholders express against the actions of the Park. It is on this backdrop that the specific issues relating to large carnivores, bears and wolf, are placed with the impact of their presence on human activities. As to the results, the restitution focuses on some synthetic elements and examples of analysis. • Among the results of synthesis, the three fundamental attitudes are reported, that are pointed out in the treatment of interviews. First, a consensus towards Park, its presence in the region and its action in general. Secondly, a set of tensions and conflicts arising from the expectations that the Park has disappointed, even though it didn’t fed them, often, as related to objectives unrelated to its mission or only indirectly linked to it. Thirdly and finally, tensions and conflicts arising from objective factors, of which the Park is directly or indirectly responsible for. Among these sites, namely, the issue of big carnivores, and above all of the wolf, with predation events. These events are to engage in broader issues of wildlife management, with all the complexity of its impacts on the human activities. From their hand, analytical examples are presented in graphical and cartographic mapping of immediate use, constructed by using a GIS specifically designed for this search by CARTOLAB. • After the presentation, the feedback from the audience stimulated in different ways (front in the PNMS, elaborations for small groups in PNGSML, with the help of the facilitator dr. Davide Tamagnini) comes soon. Many interventions show that the Park, even if sometimes overstated in its resources, both financial and institutional, is a partner in which people trust. All, in their respective roles, show to know, somehow, the issues faced. The participants, thus, recognize themselves in the Report, which eventually leads to an occasion for reflection of different stakeholders, their business, their opinions. As to what more particularly concern big carnivores, it appears significant the participation of the farmers, who tell their experiences of work; highlight how big carnivores are an obstacle to their economic interests and represent a big problem to solve, then ask, beyond general considerations, precise responses to their specific problems. Obvious dissatisfaction with compensation for damages resulting from predation, both in terms of manner as that of the extent of the sums awarded to the victims. Alongside the formal moment, the exchange, open and sometimes quite lively, takes place before the poster prepared by Dr. L. Calandra in CARTOLAB and exposed in a way of presentation of the findings of the Report. • It confirms, after the phase of the direct and precise interviews, the positive interface between the stakeholders, who are the custodians of interests, of historical memories, of local knowledge, of basic information, and the scholars who elaborate meanings and connections, allowing the public communication, in both textual and visual forms. Return and validation, allow to appreciate the difference between a general widespread awareness of the problems, - Such as "everyone knows everything, everyone is talking about" - and a scientific approach that points out the problems with accuracy, it measures them, it contextualize them, locating them also through the mapping, and delivers them officially to the public awareness. • It certifies a need of solutions that now must necessarily follow the phase of the identification of the problems. As always, the solutions would been expected "All at once". It will therefore be the responsibility of the Project, in subsequent actions, to pass the idea that this time the solutions, in fact, don’t come by any part, much less from the top, but must be made by the stakeholders collectively from the bottom. • It starts the participatory stage with the best conditions since the event, taking strength from scientific acquisition, as well as by open and available interventions of Parks highest authority, pass on all - and neatly - the idea that for the first time the Park Board wishes to actively listen, acknowledge publicly the presence of critical elements in the area, making themselves available as an interlocutor for the emergence of shared decision paths. i. return and validation results, integrated with he results of the Report. iii. 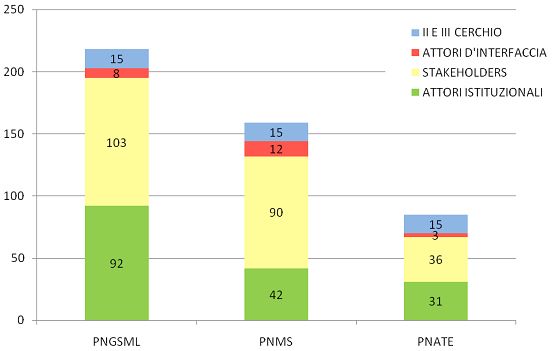 a methodological concern of communicative type, considering that a circumspect attitude of the stakeholders, not prejudicially hostile, but wary in some ways, brings in the participatory process some obstacles that in the negotiating weaving designed to produce the inclusive decision, should be evaluated very carefully, also to set the best meetings and make fully aware of their responsibility mediators and facilitators involved. A balance ex – post of the performed actions will conclude the Human Dimension. It will allow to evaluate the proper management strategy of the Project, especially regarding the diffusion of results and the transfer of best practices to the actors involved and to the other partners LIFE + EX-TRA. This balance will take place after the holding of participatory workshops, and therefore in the last year of the project (2012), also for self-evaluation purposes, in relation to the effectiveness of the method applied.